Fisher Nuts has teamed up with Food Network Chef Alex Guarnaschelli, a regular judge on Chopped, to make your holiday cooking a bit easier and offer you some simple twists for cooking with nuts during the holidays. I love Fisher Nuts! They are so incredibly fresh and a much higher quality than brands I have purchased in the past. The hardest part is not to eat all the nuts before you have a chance to cook with them. I am also a huge Food Network fan and I have learned a lot from chefs like Alex Guarnaschelli. She always inspires me to try new things in the kitchen. 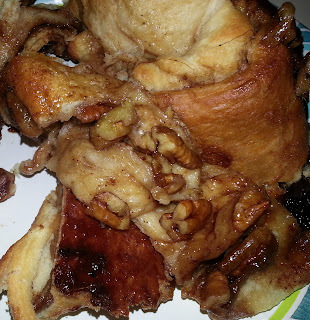 She has some great recipes listed on the Fisher Nuts website including Pear Crisp with Almonds, Stuffed White Mushrooms with Pecans and Almond Heart Cookies. I would have never have thought to add Pecans to stuffed mushrooms! See...inspiration. All of Alex’s recipes can be found at www.fishernuts.com/alex. -Savory & Sassy Sauces: Slow cooking a piece of meat? Add a few nuts to some of the cooking liquid, blend it smooth and pour it back into the rest of the cooking liquid to naturally enrich the flavor and thicken your sauce. -Quick and Simple Dessert: For a great addition to your holiday dessert table, melt some sugar in a pan until golden brown and stir in some nuts. Transfer the mixture to a baking sheet to cook and then break into pieces for a quick and simple nut brittle. Make sure you read all of her tips! They are so useful. When I received my prize pack from Fisher Nuts I had a lot of ideas and immediately started a list of things to cook/ bake. Unfortunately, I came down with the flu right after my package arrived. I was only able to make one of my ideas. I will share it with you in a moment. First I want to share some of the things that I still plan on making: Pecan-crusted Pork Chops, Roasted Nuts, Candied Pecans, Pecan Delights, Brownies with Pecans and Walnuts, Grilled Chicken Salad with Walnuts and Raspberry Vinaigrette and Alex's Stuffed White Mushrooms with Pecans. Sometimes I get a bit too inspired. One thing is for sure; once I am healthy we will have a lot of delicious nut dishes and desserts to eat. The one thing I was able to make was Cinnamon Pecan Rolls. Since I wasn't feeling good, I used packaged croissant rolls. You could make the dough homemade and these would be even better. I also must warn you that my "roll" came out a little flat. It is because I did not close my seems up well enough on the dough. Opps. -Grease large cookie sheet (or use non-stick) and unroll your croissant dough carefully. Press the dough together at the seems to form one large piece of dough. -Gently roll the dough length-wise until you have a "log"
I wish I could tell you that I have a gorgeous picture of my perfect looking Cinnamon Pecan Roll, but this is it. It was kind of an ooey-gooey mess of goodness. At least it tasted delicious. Taste is what matters, right? I am thinking of adding raisins and walnuts next time. The Fishers Pecans in this were SO good. They were candied by the brown sugar mixture. I will definitely be making these again (and hopefully improving the look as well). Buy some Fisher Nuts and get inspired (whether by Alex, another chef or even me...) and make something new and delicious this holiday season. 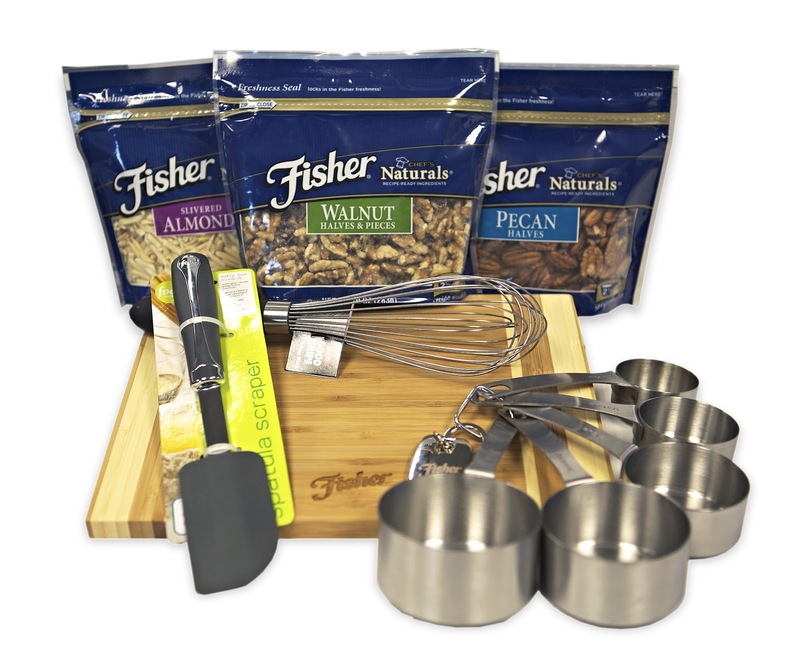 Disclosure Statement: I am working with Fisher to share Chef Alex Guarnaschelli’s recipes and create my own original recipe using Fisher Nuts and tools they provided. However, my opinions are entirely my own and I have not been paid to publish positive comments. I wish I was more of a baker like you! I love most nuts! I think pecans are my favorite. Love her tip about twist on rice. We add almonds blanched to removed the skin. Cashews have always been my favorite! Tip #9 Making a simple dessert with sugar and nuts. I love macadamia nuts the best! I like pretty much any of them, but my favorite are hazelnuts. I love most nuts but pistachios are a fave! My favorite nut changes. Right now, I think it's pecans. I like tip #10 adding nuts to salads. I LOVE Pecans the most, followed by Cashews. I really DO love nuts, I keep a little bowl of them out all the time. To encourage good snack-eating by everyone! I REALLY like the idea of the sugar and buttered, pan fried nuts! Oh my gosh that sounds really good. I am going to try it tomorrow in fact. For a movie time snack. I'd have to say my favorite nuts are pecans. I like the idea of using nuts instead of bread crumbs for coating meat. My favorite nuts are pistachios. What are your favorite type of nuts? It is a draw between cashews and almonds as I love them both. I love all her tips and she is on of my favorite chefs on television. I have used peanut butter in sauces before, but had not thought to use actual nuts and blend them in a meat juices to thicken up and use as a gravy. The one I like the best is to add to a vinaigrette dressing as I never would have thought of that. I LOVE walnuts. Thanks for the giveaway! My favorite nut in cookies is walnuts. Thanks for the giveaway. Interesting tip--do a twist on a pecan pie and add all your favorite types of nuts. My favorite Alex tip was using nuts instead of bread crumbs. Sounds interesting!! Flavorful French Toast: Coat slices of French toast with ground nuts just before browning the slices. This will add great flavor and texture. is my favorite! Healthy Snacks roast nuts with cayenne. i like Crusty Crunch: Use nuts instead of breadcrumbs for added flavor and nutrition. For example, grind some almonds and use them to make a crust for meat or fish. i think this is a wonderful and healthy way to eat.. I love her Crusty Crunch tip: Use nuts instead of breadcrumbs for added flavor and nutrition. For example, grind some almonds and use them to make a crust for meat or fish.. This is a great idea. I love pecans - they are delicious and versatile! I love Alex's idea of using crushed nuts to crust a meat instead of frying it! i love the Crusty Crunch tip! i try to avoid gluten, so substituting ground almonds for breadcrumbs is a perfect idea! i love all sorts of nuts but i think the pecan might be my all time favorite. i like the idea of using nuts in place of bread crumbs. i will definitely be trying that idea. Thanks for the recipe. They look GOOD! Flavorful French Toast: Coat slices of French toast with ground nuts just before browning the slices. This will add great flavor and texture. Your quick and simple dessert tip is great! Macadamia nuts are my fav. I'm especially fond of cashews ... they are yummy! I like the tip to use nuts instead of breadcrumbs. What a great idea! pistachios are my favorite nut. I don't really like most nuts, but my parents love all different kinds of nuts so I would love to win this for them. My favorite kind of nut is an ordinary peanut haha! I love all of Alex's tips, can't think of one favorite. I love honey roasted cashews! Walnuts would have to be my favorite. But love baking with pecans! I like her idea of using nuts instead of bread crumbs for coating meats. I like her tip "Fresh Twist on Rice" mainly because rice is so inexpensive. I love Pecans and Peanuts!!! #10 adding nuts to salads! best nut tip for me : Flavorful French Toast: Coat slices of French toast with ground nuts just before browning the slices. This will add great flavor and texture. We have 10 pecan trees so I really like pecans but I love cashews. almonds are my absolute favorite. My favorite tip is the upgraded spice rub one. The tip about using nuts instead of bread crumbs as a topping. I like pistachios and cashews. I like her tip on adding ground nuts to my spice rub for my meat. Cashews are my favorite kind of nut, especially if they are only lightly salted. Most canned cashews are way too salty for my tastes. Weird as it may sound...a half teaspoon of peanut butter added toa pot of chili is REALLY good! Although I like most nuts, I think hazelnuts are my favorite. I like the idea of using nuts to thicken the sauce on slow cooked meats. I like her tips of not just using them on their own...they really can enhance the flavor of more things than pie! I love cashews and pistachios. I really like the Quick and Simple Dessert nut brittle idea and am hoping to try to make it myself! I like the tip "Savory & Sassy Sauces: Slow cooking a piece of meat? Add a few nuts to some of the cooking liquid, blend it smooth and pour it back into the rest of the cooking liquid to naturally enrich the flavor and thicken your sauce." My fave tip is to use nuts instead of breadcrumbs for coating. Crusty Crunch tip is my favorite tip. Thanks for the giveaway... walnuts ! "Coat slices of French toast with ground nuts just before browning the slices."